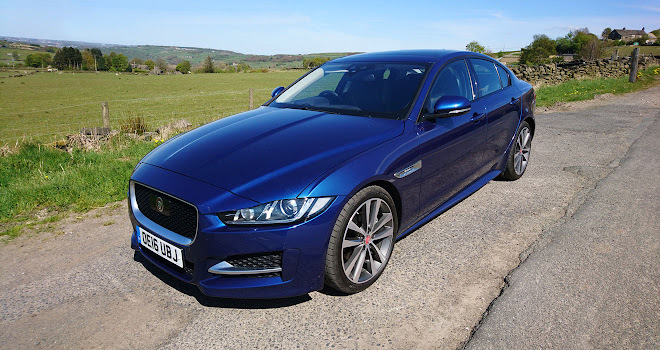 Jaguar XE review: the cat that got the green? I last drove a diesel car in the early 1990s, a Peugeot 309 provided by my employer at the time. With a non-turbo 1.9-litre engine developing all of 65bhp, it was nonetheless an excellent car. It managed to be economical, reliable, comfortable, and a great crack to drive – making me wonder why today’s cars don’t seem to be able to ride and handle anymore. As far as the boss was concerned, the main attraction of the 309 was fuel economy and of course diesels still deliver in raw miles per gallon. However, the world has changed since the 1990s. The environmental impact of the car has become more widely acknowledged and the diesel car has gone from penny-pincher to reduced-CO2-emissions planet-saver to, more recently, local-air-polluting pariah. Yes, diesel engines emit fewer grams of CO2 per kilometre than petrol engines – the reason for their elevated ‘eco’ status – but they also emit more pollutants such as nitrogen oxides (NOx), sulphur oxides and harmful particulate matter. Conversely, while petrol engines emit fewer nasty chemicals than diesels, they account for more planet-warming CO2. Environmentally, we can’t have it all ways with internal combustion. 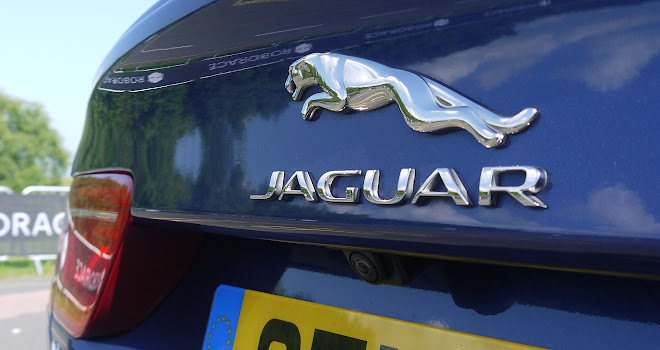 Jaguar has taken technological steps to try to mitigate the downsides of diesel, however. The company’s Ingenium engines employ various emission-control technologies such as variable exhaust valve timing and exhaust gas recirculation to reduce NOx formation and improve diesel particulate filter regeneration, and so meet Euro 6 emission regulations. During a visit to Jaguar’s engine factory in Wolverhampton I saw some of this ambition first-hand. It’s a very clean facility, and a far cry from the stereotypical image of such places. While there, I was given information about Jaguar’s efforts to produce engines to the highest standards, and also the measures the larger Jaguar Land Rover organisation is pursuing to reduce the environmental impacts of production, from a ‘zero-waste’ policy to the plant’s solar-panel installations. Indeed, in recognition of such efforts, the JLR engine plant was recently awarded the Royal Institute of British Architects (RIBA) West Midlands Sustainability Award. I drove away from the factory in one of Jaguar’s products – an XE saloon in R-Sport trim, powered by an Ingenium i4 diesel engine. The first thing that strikes about the XE is its looks. A subtle enough car in standard guise, my test car’s R-Sport styling tweaks, optional 19-inch wheels and Phosphor Blue paint made it a handsome thing – agreeably sporting, even subtly muscular, without being garish. As well as its large wheels, my test XE came with just over £10,000 worth of options, including a panoramic roof, adaptive suspension, a parking pack that included a rear-view camera, and a highway technology pack featuring a very useful blind-spot monitor built into the door mirrors. The second most striking aspect of my XE arose the moment I started the engine. This car is unmistakably a diesel, and you’d be unlikely ever to forget it. As soon as I pushed the start button, an almost-tangible vibration became ever present and, in heavy traffic, the cough of the stop/start facility also acted as a repeated aural reminder. Jaguar’s 2.0-litre turbocharged diesel engine provides 178bhp and, when coupled with an eight-speed automatic gearbox, has a CO2 rating of 111g/km. Performance felt surprisingly leisurely off the line, but I found plenty of mid-range grunt for overtaking, even in the car’s Eco driving mode, which I used for most of my week-long test. The car seemed really quite rapid in-gear, with the turbo providing plenty of boost when needed. Happily, while the engine’s diesel timbre was always obvious at lower speeds, the XE became more refined – certainly sounding less diesel-like – at higher speeds. Jaguar makes great play of the use of aluminium in the XE’s construction, and the potential for weight-saving it brings. “Just add lightness”, as Lotus founder Colin Chapman famously observed. So it’s disappointing to find that the XE is heavier than competitors like the Audi A4, BMW 3-Series and Mercedes-Benz C-Class. A feeling of weight is ever present which makes one wonder how heavy the XE would be with more conventional steel construction. Still, aluminium must surely bring benefits when it comes to recycling the car at the end of its life. On paper, this weight tells in performance figures, which may matter to some but really is of no consequence in a real-world Rochdale rush-hour. While it can’t help with economy either, the XE reliably returned mile-per-gallon figures ranging from the high-50s to the mid-60s across a variety of trips, according to the car’s touchscreen. Even an enthusiastic last-day blast across the moors returned a respectable 49.9mpg. 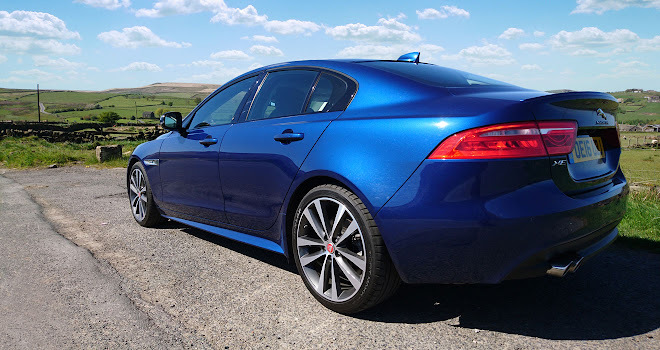 The XE’s handling has been widely praised, and I didn’t find it disappointing. 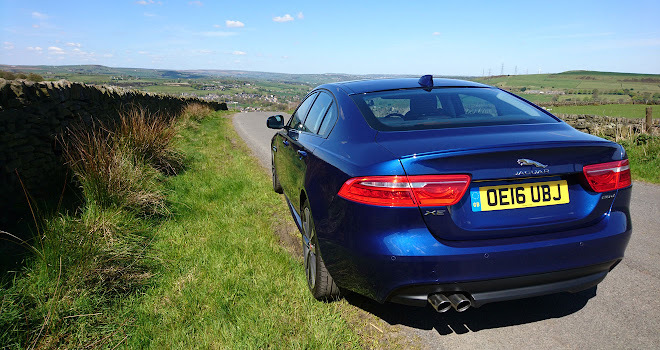 The car can feel large for a compact executive saloon car, at just over 15 feet long, but it was nonetheless fun to hustle along the country roads of Lancashire and West Yorkshire. I found it confidently sure-footed, seeming to gain extra poise in the middle of a sharpening bend. This welcome feeling is no doubt a result of the XE’s torque vectoring capability, which can independently brake the car’s inside wheels to help stay on the chosen line during hard cornering. Given my car’s R-Sport spec, I was expecting a relatively unforgiving ride. The roads in my locale are not the best, being variously pot-holed, speed-humped and poorly surfaced. 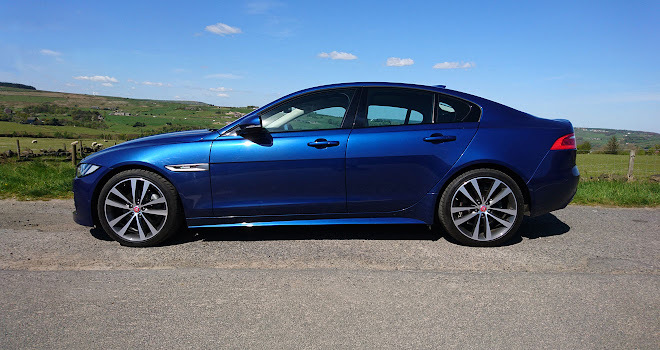 In fact, the ride of the XE R-Sport was one of the big surprises of my time with the car. It proved very composed, even comfortable, traversing poor surfaces and traffic-calming measures with surprising aplomb given its sporting intentions. Inside, the XE proved a pleasant enough place to be, especially in the front. I found the driving position excellent, the multi-adjustable seats comfortable, and the steering wheel pleasant to the touch. 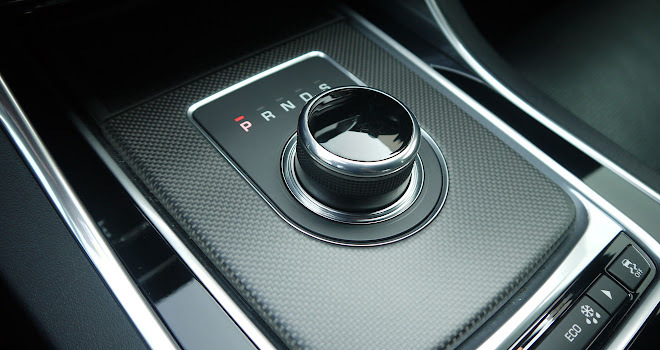 Push the start button and the gear selector’s rise from the centre console is always an enchanting event, particularly for first-time passengers. 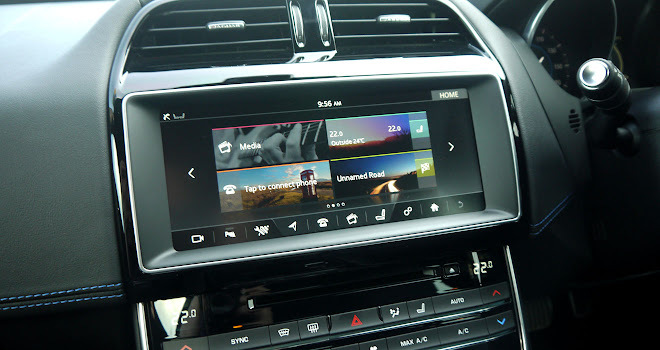 The eight-inch touchscreen – equipped with a very useful navigation option – proved big enough to be clear but not distracting, and the head-up display fitted as part of the optional highway technology pack was a great feature that I’d like to see fitted more widely. 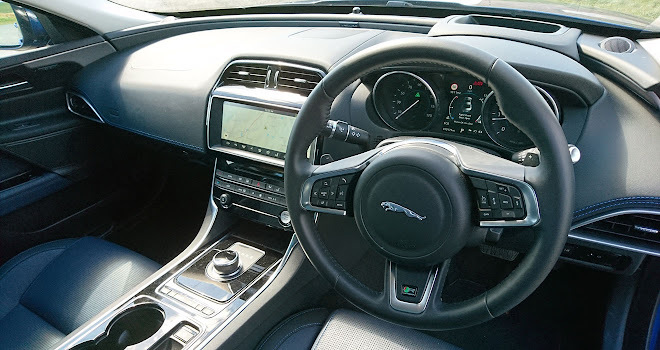 The design of the interior is inoffensive enough overall, although ideas about how a Jaguar ought to ‘feel’ often came to the fore, with more than one passenger commenting that the XE didn’t feel “like a Jaguar” – “Where’s the wood?”, asked one. Jaguar has moved on, fumigating the whiff of boardroom and golf club as it has done so, even though it seems some old perceptions haven’t quite faded away. One other dark blue means of transport is renowned for being bigger on the inside than the outside. Unfortunately the converse seemed to be true for my dark blue XE. Transporting my quiz team to a meal out meant sitting three abreast in the rear, and while legroom was reported as fine, shoulder and headroom were very much at a premium, requiring an impromptu game of Twister to fasten seatbelts unless each passenger strapped themselves in one at a time. 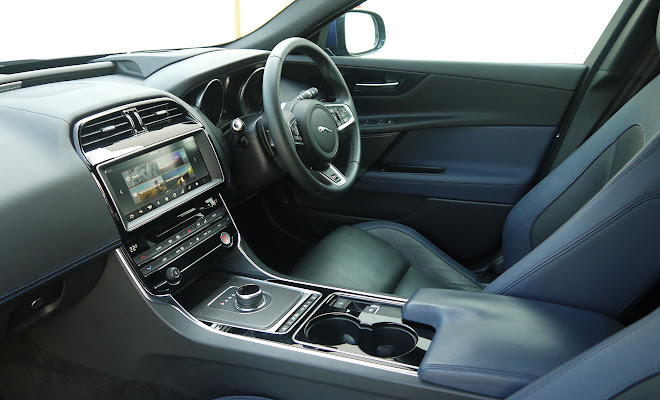 The XE may be commodious enough for four, but it isn’t really a full five-seater. The boot is accommodating enough, and was large enough to hold a full-size 19-inch alloy wheel of quite ample breadth, while waiting for a replacement tyre after an unexplained puncture. It took 36 hours to procure the right rubber and, being accustomed to driving cars with off-the-shelf tyres, I can’t help but note that choosing big wheels can let you in for somebe an unwelcome faff. The puncture was the only fly in the week’s ointment, however. 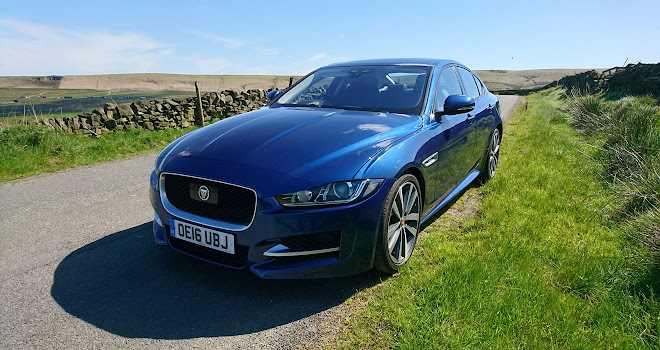 The XE is a fine-looking, great-handling car, possessed of a supple ride (surprisingly so, in R-Sport guise), very usable real-world performance and reasonable economy too. If you’re in the market for a compact executive saloon, it’s well worth considering, especially if dynamic prowess is a priority.